Aerial view of the future 902 Brewing Company along Pacific Avenue, Bergen-Lafayette, Jersey City. Rendering courtesy Mukti Architecture. 902 Brewing Company has come a long way from what was once a modest beer brewing experiment between two Hoboken roommates at the beginning of this decade, and now, plans are officially in place to house the entire business under one roof at a large Jersey City facility. The brewery, officially formed in 2012 by Colby Janisch, Tucker Littleton, Andrew Brown, and Don Vogt, is named for the Washington Street building where Janisch and Littleton dabbled in the aforementioned brewing trials. They’ve been working their hoppy magic out of New Jersey Beer Company’s North Bergen facility since 2016 and announced plans to merge with that company that should wrap up within the next year. 902 Brewing has long desired to open a tap room, and at one point, had toyed with putting a small one in Hoboken. But like many residents of the Mile Square City, they moved west for more space and have now found a spot to land in Jersey City’s Bergen-Lafayette neighborhood. 902 Brewing Company exterior. Rendering courtesy Mukti Architecture. Company President Colby Janisch told Jersey Digs that 902 has officially signed a lease for a warehouse property on Pacific Avenue that spans over 6,000 square feet. That amount of space will potentially allow the company to brew over 5,000 barrels of beer annually and give them a spot to open a tap room. The facility will also boast a rooftop deck with gorgeous views. Roof deck. Rendering courtesy Mukti Architecture. The newfound freedom will also allow the company to experiment more with their brews. In addition to their flagships of Heaven, Hell or Hoboken IPA and Pale Ale True Hoboken (dubbed P.A.T.H. ), 902 Brewing currently puts out two to three new beers every month. 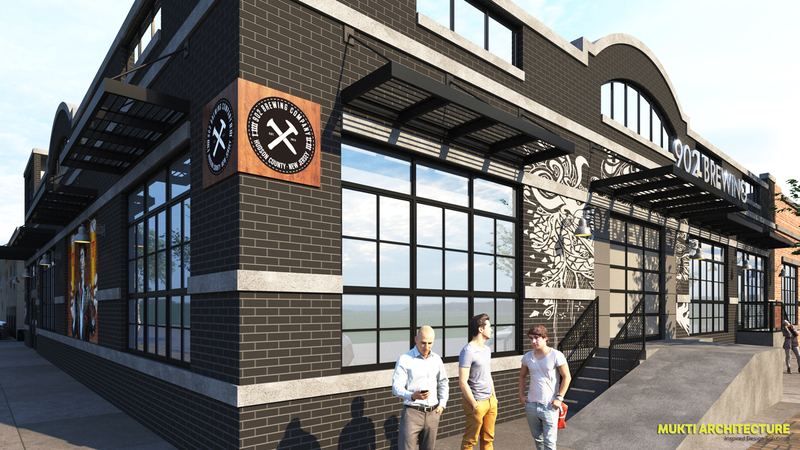 The new facility will enable them to increase that number to four or five, and potential future additions include sours, stouts, New England IPAs, and other inventive selections. 902 brews. Photo via 902 Brewing Company. The renovation of the building itself will embrace the industrial feel already present at the property and is set to include murals from a local artist. The new digs will give the company a home base for their ever-expanding business, as 902 recently signed with Thunderbolt, a South Jersey distributor, that will put their beers on shelves as far as the Atlantic City region. One group that’s undoubtedly pleased that 902’s beers will be more readily available in the Garden State is Hoboken’s American Legion Post 107. The company announced over Memorial Day that a portion of sales revenue from their Heaven, Hell or Hoboken beer will be donated towards rebuilding the Post’s Sandy-damaged property with apartments for homeless veterans, an effort that will continue until the Post has met its campaign goals. Janisch says that Bergen-Lafayette residents were receptive to the company’s brewery and tap room plans during a community meeting they recently held, but 902 will need a zoning variance to operate their vision. As a result, the company will need to go before Jersey City’s planning board, which they hope will happen sometime this month. Great post, will the North Bergen NJbeerco remain open? Not a neighborhood where I would drink. the best place to drink. expand your mind. don’t be scared. this is what is wrong with many new transplant residents. Fantastic news. We’re hoping to keep it “hood” as long as possible before your kind infiltrates and kills its soul like downtown. Will there be jobs for the residents of Bergen/Lafayette? At our community meeting this one of out top concerns, and they said they will hire local residents. Exciting news! Was at the meeting. This is an abandoned/former industrial area where this brewery and the Corgi Spirits(Gin and Vodka near by) are changing the culture of the neighborhood. They are hiring from within the neighborhood. Also will have food trucks near by. Can’t wait! Happy for 902 and their expanding business. Now that they will have a brick and mortar brewery of their own, they need to tread lightly with the allegiance they’ve shown to Hoboken. None of their beers pay tribute to the city or neighborhood in which they plan to operate (think “Heaven, Hell or Hoboken IPA” and “Pale Ale True Hoboken” aka P.A.T.H., not “BeLa Saison” or “Bergen Brown Ale”). As a local JC resident who does not live in downtown JC, I welcome the development. However, I’m a proud JC resident, and would rather drink a beer that pays homage to the neighborhood in which it was made. Anything otherwise would be nothing but phony. What is the proposed location on Pacific? I think its great that 902 Brewing Co.is located in a underdeveloped area. Thats how Brooklyn Brewery improved the Williamsburg Brooklyn area. Keep an open mind and see how things have changed ie Newport area of Jersey City and Asbury Park NJ. in the last 20 years. I wish 902 success with the new location.